In typical Jack Nicklaus fashion, the Nicklaus Course calls for more exacting tee shots and approaches than the other two golf courses at Reunion Resort. 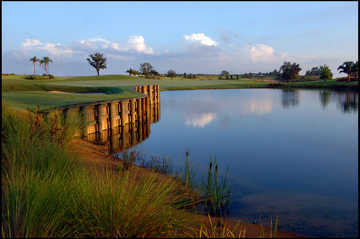 Designed by Nicklaus and son, Jackie, the Nicklaus Course is considered the most difficult of the three courses at Reunion resort. This parkland-style layout features fast TifEagle greens and water hazards that come into play on seven holes. There are also more than 100 bunkers on the course, carefully placed to catch poor club selections both off the tee and on the approach. The Nicklaus course is not your typical resort course; it's more of a "player's" course. Scoring well here requires a significant amount of accuracy off the tee - anything hit wide left or right will either be irretrievable or in some sort of hazard - most likely a waste bunker. A player who is more of a thinker as opposed to someone who wants to grip it and rip it will prevail out here. There are a lot of bunkers and waste areas along the way; many have been placed strategically in the landing areas which again places an emphasis on accuracy off the tee. I found myself in several of them; I guess that’s how you know you’ve got the right set of tees! The green complexes are what make the Nicklaus Course truly challenging. Most holes have modestly elevated greens although a few are very significant. 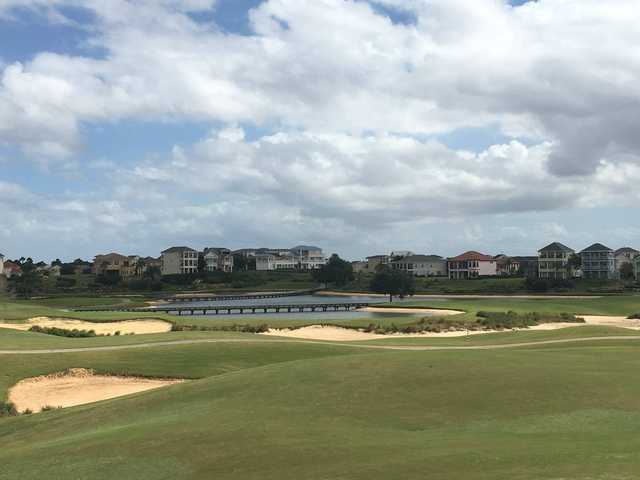 The way these green complexes are set up and bunkered, a bump-and-run approach shot is not usually an option unless you are skilled at running the ball through a bunker! Most green complexes require you to fly the ball on to the putting surface. Once there, the subtle little undulations of the green take over. Be sure to study all putts carefully, even the tap-ins; there are not a lot of straight putts out here. The course is in great shape year-round and the grounds crew is painstakingly meticulous. Staff is friendly and helpful, especially the starters. If you haven't played the course before, listen to them carefully. They will give you a wealth of information. If you're in the area, you owe it to yourself and your golf game to play the Nicklaus Course at Reunion Resort. After all, it's the perfect destination for a great round of golf on one of three fabulous courses designed by three of golf's greatest players. It's also a great spot for a family vacation. Come to think of it, why not do both?